The traffic on the Capital Beltway around Washington, D.C. is ridiculous. It doesn't matter what time of day it is, there's always traffic. Of course some times of day are worse than others. Hello, 4:30 in the afternoon. We have to be on the road, in traffic every day, because that's what we do. Getting stuck in traffic is my job. What I don't understand are the people who choose to be in traffic, sometimes over an hour a day in just one direction. I've been caught in beltway traffic for several hours and I'm just passing through. I can't imagine doing this drive on purpose. 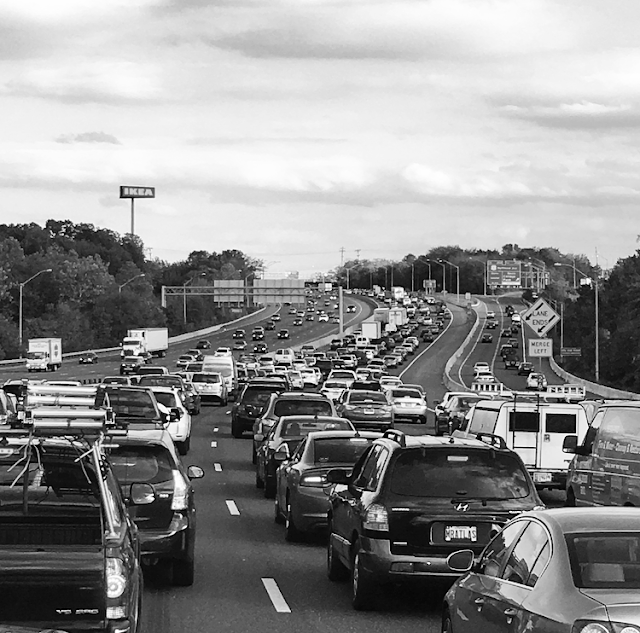 What kind of job is worth sitting in traffic morning, afternoon, and night? I've never in my life lived more than 20 minutes from any job I've ever had. Even when I lived in Alexandria, Virginia, I worked seven miles away in Arlington, and it took me 15 minutes to get there on average. There's no job on earth I would do that required me to sit in traffic for two hours. Even if that job were in paradise and they paid me in kittens, gold coins, and Twinkies. I suspect sitting in and maneuvering through traffic takes months off one's life. It's a stressor. Will be bolting this traffic-plagued wonderland without ever having figured out which is the inner loop and which is the outer loop! I recognize where you were on 495. Maryland this time, but Virginia's got I-95 south, as you know.